A crowd protests outside the Broward County supervisor of elections office, Nov. 9, 2018, in Lauderhill, Fla.
Undecided races in Tuesday's midterm U.S. elections are keeping the states of Florida, Georgia and Arizona on edge. In Florida, center of controversy over the close presidential election in 2000, Democratic Sen. Bill Nelson and Republican Gov. Rick Scott are locked in an extremely close contest for the Senate, with Scott holding a lead in the vote count of less than a percentage point but Nelson gaining ground. 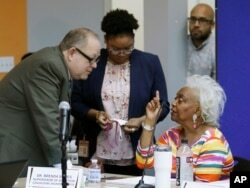 Brenda Snipes, Broward County supervisor of elections, right, speaks with officials before a canvassing board meeting Nov. 9, 2018, in Lauderhill, Fla. Florida will learn Saturday afternoon whether there will be recounts in the U.S. Senate race between Republican Gov. Rick Scott and incumbent Democrat Bill Nelson; and in the governor’s race between former Republican U.S. Rep. Ron DeSantis and the Democratic mayor of Tallahassee, Andrew Gillum. Scott, the challenger, has sued supervisors of elections in both Broward and Palm Beach counties, accusing them of mishandling the ballot count. These same two Democratic-leaning counties proved problematic in providing voter returns in the 2000 presidential election when Republican George W. Bush narrowly defeated Democrat Al Gore in a historic recount. The race to fill Scott's post as Florida governor also is still too close to call, which may trigger an automatic recount even though Democrat Andrew Gillum already has conceded to Republican Ron DeSantis. Florida is tied with New York for the third-highest number of Electoral College votes (29), so its political landscape will have significant influence on the presidential election in 2020, when President Donald Trump is expected to seek re-election and the Democrats will try to unseat him. 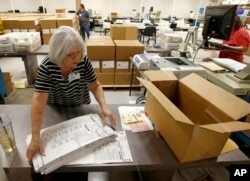 Workers at the Maricopa County recorder's office go through ballots Nov. 8, 2018, in Phoenix. There are several races too close to call in Arizona, especially the Senate race between Democratic candidate Kyrsten Sinema and Republican candidate Martha McSally. In another close vote, Arizona is still trying to determine the winner of the contest between Democrat Kyrsten Sinema and Republican Martha McSally, who are vying to fill the seat left open by retiring Republican Senator Jeff Flake. Officials are still tallying mail-in ballots, with Sinema ahead by fewer than 10,000 votes. As of Thursday night, more than 400,000 ballots still had not been counted, because about 75 percent of Arizona voters cast their ballots by mail. In Mississippi, a runoff election is expected in late November between Republican Sen. Cindy Hyde-Smith and Democratic challenger Mike Espy. Regardless of the outcomes in these states, Republicans will hold at least 51 Senate seats in the new term, giving them a majority in the 100-seat Senate. Trump spoke to reporters early Friday before boarding a flight to Paris. Commenting on the Florida controversy, he said Scott "won by a comfortable margin." He also criticized the woman in charge of supervising elections in Broward County, saying, "She has had a horrible history." In the southern state of Georgia, the governor's race is still in dispute, although Republican Brian Kemp, who at present has 50.3 percent of the vote, has declared victory. Democrat Stacey Abrams has 48.7 percent of the vote. But Abrams, the first African-American woman to be named a gubernatorial candidate in Georgia by either major party, has said she will not concede until every vote is counted.